Woods’ artistic practice bridges the fine-art world with the beauty shop. She creates elaborate, exaggerated braided headdresses and press-on nail tips, often bringing them into fine-art contexts to adorn visitors. Neon-pink nail tips are decorated with oversized gold dollar signs. Red and blue shower poufs have been deconstructed and then woven into intricate hair weaves. Her ghetto-fabulous aesthetic looks straight out of a Nicki Minaj music video, yet her personal appearance is surprisingly neat and conservative. She keeps her hair and nails short, her friendly smile decorated only with clear lip gloss. 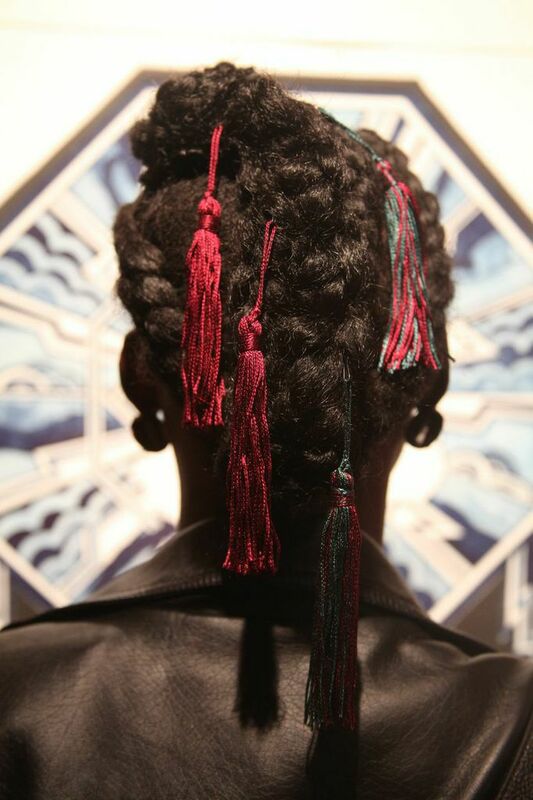 Last month, Woods opened her exhibition “Bricoleur” with an event she described as a “collaborative, interactive fiber installation and hair braiding experience” at Azimuth Projects, an apartment gallery in Logan Square with hair braider Fatimata Traore. Visitors took turns having their hair braided and then “accented” with shiny door-knocker earrings and colorful tassels. Woods’ sculptural works comprised of hairpieces and jewelry remain on display in the space. Woods’ work speaks a lot about gender, race and class. As a white woman who uses African-American motifs and stylistic influences, she is very interested in the distinction between cultural appropriation and cultural exchange. She admits the dubiousness therein, but encourages the open exchange of ideas and opinions on the subject at her events. “It kind of counteracts the experience that someone would have going to a museum with a painting, where it’s like a one-sided dialogue,” Woods adds. “I think there’s power in being able to interact with another human being. You can talk about a color of nail polish or you can have a deep theoretical conversation about surface and detail and the feminine and privilege, labor, class. Outrageous hair and nails like these challenge the notion that you have to look a certain way—respectability politics. Like wearing an Afro to the office, you’d be asked to tone it down. I like asserting yourself against that. Sarah Beth Woods’ work is exhibited at Azimuth Projects through October 26, with a closing reception and artist talk that day starting at 12:30pm.